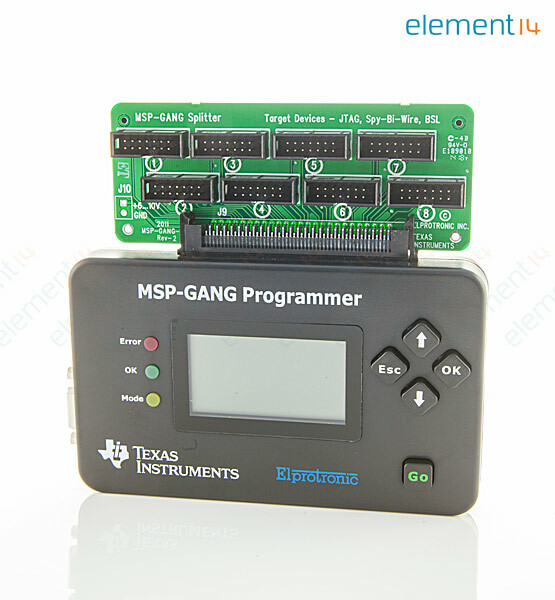 The MSP-GANG is a production programmer for MSP430 device that can program up to eight identical MSP430 flash or FRAM devices at the same time. The MSP Gang Programmer connects to a host PC using a standard RS232 or USB connection and provides flexible programming options that allow the user to fully customize the process. The MSP Gang programmer is provided with an expansion board, called the Gang splitter, that implements the interconnections between the MSP Gang programmer and multiple target devices. Eight cables are provided that connect the expansion board to eight target devices (via JTAG or Spy bi wire connectors). The programming can be done with a PC or as a standalone device. A PC side graphical user interface is also available and is DLL based.